Igneous rocks form when magma cools and solidifies. This happens both above and below the surface of Earth. 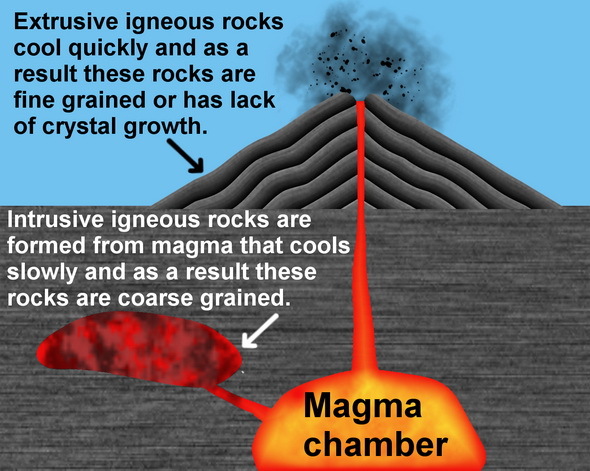 Magma is made up of the atoms and molecules of melted minerals that rearrange themselves into mineral grains. When magma cools, rocks are formed. Magma can be forced into adjacent rocks, forced to the surface as lava, and also be blown out in volcanic explosions. Over 700 different types of igneous rocks exist. Some of these types include granite, pumice, obsidian, tuff, and basalt. Granite is a very common rock that contains 25% quartz and is commonly used in construction due to its strength and abundance. Pumice is a very lightweight rock that forms when molten rock is quickly blown out of a volcano. As pressure is lost and the rock cools quickly, tiny bubbles (vesicles) are formed. Obsidian is a volcanic glass that forms very rapidly without any crystal growth. Its edges are sharp and smooth making it a great choice for cutting tools or arrowheads. Tuff is a rock formed from volcanic ash. During volcanic eruptions, rock, ash, and magma falls back onto Earth and is compacted and cemented into a rock, becoming a lens-shaped deposit called tuff. Basalt is extremely common rock found all over our solar system. It is used in building materials and thermal insulators. When subjected to extreme heat and pressure over time it will metamorphosize into granulate. Howard Fensterman Minerals > Geology > What Are Igneous Rocks?